Once upon a time, we can definitely remember saying “someone should open a paleo/primal/healthy take away…they would do really well!” because finding a place to eat when you’re on the go can be a difficult task…especially when you have to constantly ask “does that contain gluten/dairy/refined sugar? Is the chicken free-range? And is the beef grass-fed?” The list of questions goes on and on. Well we are super excited to announce that our takeaway anxiety (this isn’t a real thing) is now cured with the opening of THR1VE in our home town of Canberra (they are also open in Sydney). THR1VE is all about providing quick, nutritious, delicious + fresh food take away options. Well stop the press + hallelujah! Where have you been all our lives?! THR1VE’s menu is like a ‘choose your own adventure’. For breakfast and lunch you choose your base, then your main and then add your extras! They also have ‘grab-n-go’ options which provide for an even quicker way to get your healthy feed! We have visited two times now (all in the name of research to provide you a decent overview of what’s on offer…and perhaps for our own taste bud pleasure!) and are more than happy to say that THR1VE ticks all our boxes. We also tried the paleo pancakes… one of our favourite things to make ourselves! Cute factor = 100! MINI. DUTCH. PALEO. PANCAKES (why haven’t we thought of that before?!) topped with maple syrup + cinnamon, these are delish and for $5.50 you can’t go wrong! You can also choose to add banana (for no extra cost!) we forgot to do this but would definitely recommend it. The following week we visited for dinner. We both have issues with food envy so ended up ordering the same thing. A lunch bowl with sweet potato + cauli mash, crisp greens with lemon + herb marinated chicken, roast capsicums and basil pesto (we added smashed avocado because avocado makes EVERYTHING better)…gourmet to go! The chicken was delicious, tender + moist and again we weren’t wondering where the rest of our meal was! The best thing is that we only waited two minutes from the time we ordered till when our dinner was delivered! Healthy fast food…who woulda thought? So the verdict? Healthy, satisfying, fast. Tick! Tick! Tick! We plan on venturing back to try everything else on the menu, especially the salmon + minute steak, which have all had raving reviews from our friends. We also hear on the grape vine that the menu is seasonal…so expect some fresh changes come Spring/Summer! Woohoo! Inspired by our recent visit to THR1VE we have revised our pancake recipe (yes we have a banana recipe as well as a sweet potato version which are equally delish)…introducing our paleo pumpkin + raspberry pancakes! p.s we apologise for making everyone else jealous with this post, surely THR1VE stores will be popping up all over the place soon?! We sure hope so! paleo pumpkin + raspberry pancakes. Cook the pumpkin cubes (we boiled ours) until soft. Whiz the pumpkin with a food processor (we use our Vitamix) until smooth. Add the eggs + egg whites and whiz again until combined. Add the coconut flour, cinnamon and natvia + whiz again until really really smooth. Now add your raspberries. We like them to be chunky so whiz a little but not too much! Heat your coconut oil in a large sauce pan to medium heat (you don't want it too hot, otherwise they will burn). Place spoonfuls of the mixture into the sauce pan. Cook for around three minutes or until they start to bubble. Flip VERY VERY carefully. Did we mention flip these carefully? It is a soft mixture so flip them carefully... ok you guys get it. Cook for a further 3 mins + then keep warm on a plate covered with some foil. Continue to make the rest of your pancakes until all the mixture is finished. 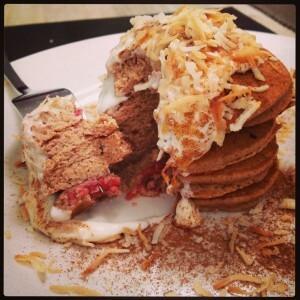 To serve, stack your pancakes + top with what ever your taste buds desire!